Located primarily in Harris County but also stretching out into Chambers County down in the Gulf Coast region of the state, Bayton is a mid-size Texas city. It's located just to the east of Houston, offering quick and easy access into the state's biggest city while also boasting its own charms, attractions, and unique reasons to visit. Home to around 85,000 people, Baytown is situated in close proximity to the outlets of both the Buffalo Bayou and San Jacinto River, making it a popular spot for camping trips and outdoor adventures. with the San Jacinto Mall right nearby and the Houston Raceway also situated in Baytown, the city has a lot to offer for people of all different ages, backgrounds, and dispositions. The Baytown Nature Center is a popular place to visit, with this 450 acre peninsula offering all sorts of beautiful walking trails and wildlife spotting potential, while the San Jacinto Museum of History or San Jacinto Battleground State Historic Site can appeal to history buffs and the Pirates Bay Waterpark is a big hit with families and young children. All in all, Baytown is a great place to visit and the area is home to lots of highly rated RV parks and campgrounds to accommodate you and your fellow travelers for both short and long term stays. Read on to learn all about the best rated RV parks in Baytown, TX. Situated in a central location in the heart of Baytown, Baytown RV is one of the best rated RV parks in this coastal city. It's only a short drive away from all the main attractions and landmarks of Baytown, so if you're visiting this city and want to make the most of your trip without having to worry about making lengthy journeys each and every day, Baytown RV is a great place to start. It offers a calm and peaceful environment to ensure you always get a good night’s rest without any interruptions or distractions, while also being situated in close proximity to many lively locations and store-lined streets. Easily accessed from both Highway 146 and Interstate 10, Baytown RV offers mote than 60 RV spaces with 20/30/50 amp power and the standard full hook-up utilities like water and sewer. You'll also get cable TV channels included in with the standard rate and complimentary internet access too. The Baytown Nature Center and San Jacinto Battleship Grounds are right nearby, and the on-site amenities at this Baytown RV park include private mailboxes, concrete pads, landscaped spaces, and a spacious laundry area with coin operated washers and dryers to be used whenever you need them. If you're visiting Baytown to actually spend some time out on the bay, admiring the waters and soaking up some sun, the Galveston Bay RV Resort is a great RV park to choose. This highly rated RV park is ranked as one of the best in the city and stands out in all aspects, including affordability and amenities. The rates at Galveston Bay RV Resort start at just $50 per day, rising to $240 for a week. Various monthly rates are also available for long term stays, with higher charges for the more exclusive sites with views over the water. 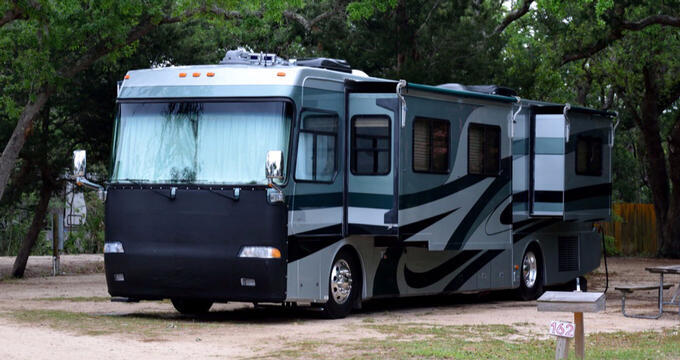 All RV sites at Galveston Bay RV Resort feature full hook-up utilities including electric, water, and sewer. All guests at this Baytown RV park will also be able to enjoy the on-site amenities like lots of green spaces, high speed internet access, a swimming pool, laundry machines to keep all your clothes and linen clean and fresh, a fishing pier, a fish cleaning station, 20/30/50 amp power, security patrols, and more. Conveniently located in a prime, central spot, Casa RV Park offers quick and easy access to all the main attractions and landmarks of Baytown. One of the best reasons to stay at this Baytown RV park is its service; Casa RV Park has received a lot of great reviews for the cleanliness of its facilities and the friendliness of its management team, so if you want to be treated with care and enjoy an authentic Texas welcome, this is the place to be. The rates here are also very affordable and you'll find lots of good amenities and facilities in the local area. Casa RV Park provides warm welcomes to all guests, but it also offers a great selection of amenities including lots of free cable TV channels at each RV site and high speed Wi-Fi access too. You can also request a telephone hook-up if you need one, and you'll be given your own private mailbox if needed too. Suitable for both long and short term stays, this Baytown RV park also features storage units, propane sales, and a laundry area with washers and dryers. Daily rates at Casa RV Park begin at just $30, with weekly stays available for the low price of $150.